Brighouse lost for the fourth time in six pre-season games as they were beaten 2-1 by Northern Counties side Penistone Church. Vill Powell’s side have won just once so far in pre-season, winning 2-1 at Eccleshill United. Town have also drawn 2-2 with Liversedge while losing to Halifax Town, Hemel Hempstead and Harrogate Town. Nathan Keightley gave Penistone Church the lead after six minutes following a defensive mix up between Adam Field and the trialist goalkeeper and the hosts increased their lead through Kieran Ryan on 35 minutes. Town, who had been unlucky not to score through Mohammed Ibrahim when the home keeper stuck out a leg at the last minute, did pull a goal back in the 41st minute when Tom Robinson came in from the left and unleashed a dipping shot from 22 yards out. The score remained the same in the second 45 minutes with both sides having chances. It was an open contest and Powell thought it was a good test against an organised outfit. 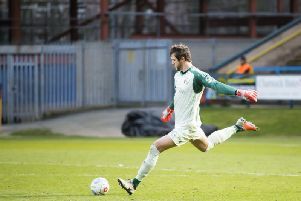 “Both goals came from goalkeeping errors and I shall be sourcing a keeper for Saturday’s home game with Basford Utd (3pm), seeing as my two choices are both away,” he said. Town visited the Nottingham club last season, when Basford went on to win promotion to the Evo-Stik NPL Premier Division from the southern section’s Division One, and won 2-1. Michael Collins has withdrawn his Bradford City side from a pre-season friendly next Tuesday but has promised to play one inside 12 months. Powell has instead agreed to host Clitheroe on Monday (7.45pm) and will complete his friendlies with the visit of Prescot Cables on Thursday (7.45pm). The season starts at home to Derbyshire club Gresley FC on Saturday, August 18.